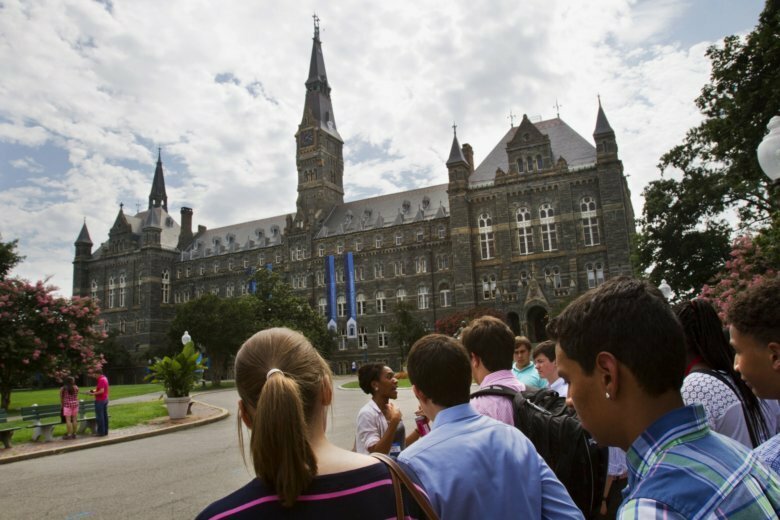 The petition was started by alumnus Mickey Lee, who said allowing those involved in the scandal to retain their degrees "severely degrades the standards and prestige of Georgetown University." An online petition that calls on Georgetown University to rescind the degrees or admittance of students and alumni implicated in the nationwide admissions scandal has gathered over 15,000 signatures. Some 50 people have been charged in the college entrance bribery scheme involving wealthy parents and coaches at several elite universities. One of those people is former Georgetown tennis coach Gordon Ernst. Ernst would allegedly notify Georgetown’s admissions office he offered an applicant a spot on the tennis team. According to court documents, he offered at least 12 students a spot on the team despite knowing they were not competitive athletes. Ernst was paid more that $2.7 million to facilitate the admission of these students. One family alone paid Ernst $400,000, according to charging documents. “The reputation, honor, and future of our university will remain permanently tarnished unless Georgetown University wipes the stain off by erasing these mistakes from its history,” Lee said in the petition. The petition also calls for a public apology for all alumni and students, as well as qualified students whose admission may have been deferred or denied due to the illicit scheme. Hill added that more information could be found on the university’s FAQ page on the investigation.